We describe here the expression pattern of the breast cell growthinhibitor Mammastatin in normal and breast cancer cells. Normal Cells (NHMC)over-express Mammastatin in low calcium media. Mammastatin has been isolatedfrom low calcium conditions to demonstrate that it is a tissue specific growthinhibitor. These studies demonstrate that Mammastatin is expressed as a 53 kD,growth inhibitory protein in 138/138 normal breast cell lysates and isexpressed as a 44 kD species without activity (where measured) in 28 of 41breast cancer cell lysates. Consistent differential expression of Mammastatinsuggests a negative role for Mammastatin in cellular transformation. Cancer has been shown to be a multi-varient disease that can becaused by many different factors. The most widely accepted cause for cancer isa mutation that interrupts the coding sequence of a critical growth controlgene in a manner that either activates a growth stimulatory pathway orinactivates a growth inhibitory pathway. In our view, both of these phenomenamust occur. There is significant evidence to support the hypothesis that cancerresults from the combination of lack of growth control and a growth promotingmutation. The growth promoting mutations have been shown to span the signaltransduction pathway from external growth factor to cell cycle control genes.The growth restricting pathways are not as well understood. We describe here agrowth inhibitory protein that is consistently absent in breast cancer.Mammastatin, is expressed in 70% of breast cancers but is not expressed as the53 kD form identified in normal cells in any cell line or tissue lysate. Asreported elsewhere the protein is expressed as an active, 53 kD, phosphorylatedprotein only in normal breast epithelial cells (in press). The 44 kD speciesidentified in breast cancer cell lines is not growth inhibitory. Our currentobservations of differential expression of the protein Mammastatin may provideinsight into the transformation process. The aim of this study was to determine whether Mammastatin wasexpressed in breast cancer cells. As a growth inhibitory protein that is activeon breast cancer cell lines it was not expected that Mammastatin would beidentified in breast cancer cell lines or tissues. Surprisingly, Mammastatinhas been identified in both breast cancer cell lines and tissues. SinceMammastatin was identified in both tumor tissues and cell lines, the nature ofMammastatin expression in these samples was more thoroughly investigated. Normal human mammary cells (NHMC) were derived from human tissueobtained from plastic surgery. Cells were reduced to culture and grownessentially as described . Cells were disassociatedwith collagenase and plated initially as organoid cultures. Organoid cultureswere incubated in RPMI media supplemented with 10% fetal bovine serum, 10μg/ml insulin and penicillin/streptomycin for the first week. Long-termcell cultures were grown in low calcium media [DMEM/F12 with 40 μMCaCl2 (Life technologies, custom services) supplemented with 5%chelex treated equine sera (Sigma), 0.1 μg/ml cholera toxin, 0.5μg/ml hydrocortisone, 10 ng/ml epidermal growth factor, 10 μg/mlinsulin, 1/1000 gentamycin sulfate] . Cells wereexpanded by collecting floating cells from confluent cultures when feeding, andreplating these 'floater' cells in fresh flasks. Cells were onlytrypsinized within the first two weeks in cultures. Immunoperoxidase staining was performed on tissue sections fixedon poly-lysine coated slides. Fixed samples were incubated for 15 minutes with5% non-fat dry milk (NFDM) in TBS to block non-specific binding. Primaryantibody (7G6 anti-mammastatin or 38C13 anti-idiotypic control AB) was added ata concentration of 1:250, antibody in 5% NFDM in TBS (approximately 5μg/ml), and incubated for 2 hours at room temperature. Slides were thenincubated in TBS with 0.1% Triton X-100 for five minutes, three times at roomtemperature. Care was taken not to disturb cells on slides when adding orremoving solutions. Secondary antibody (GAM-IgM-HRP) was incubated with theslides for 1.5 hours at a concentration of 1:500 (2 μg/ml),antibody:buffer at room temperature in 5% NFDM/TBS. The slides were incubatedin TBS with 0.1% Triton X-100 for five minutes, five times, before developmentwith DAB substrate . Slides were preserved with adrop of aquamount before application of a glass coverslip. Western Blots were performed essentially as described. Proteins from ten percent SDS/PAGE gels weretransferred electrophoretically to nitrocellulose membranes (0.45 μmSchleicher and Schuell) in the presence of 10% methanol without SDS for 1 hourat 200 mA using a Biorad mini-transfer apparatus. Filters were incubated with5% NFDM in TBS (Tris buffered saline) to block for 30-60 minutes and thenincubated with the primary antibody at 1:1000 dilution (1 μg/ml) in 5%NFDM/TBS at 20°C for 1.5 hours. Filters were washed TritonX-100tm in TBS. Secondary antibody (Goat anti-mouse IgM-ALPH,Southern Biotech Corp., Birmingham, Al.) was used for 1 hour at 1 ug/ml in 5%NFDM/TBS at 20°C. Filters were washed with 0.1% Triton X-100 in TBS.Proteins were visualized using the NBT/BCIP substrate system (LifeTechnology). Mammastatin is a protein identified in normal human mammary cells. Mammastatin, identified in and isolated from normalhuman mammary cell (NHMC) conditioned media, inhibits the growth of transformedmammary cells in a tissue-specific manner . Since itis possible that lack of a growth inhibitor may be involved in loss of growthcontrol, Mammastatin is being studied as a potential breast cancer therapy.These studies describe the expression patterns of Mammastatin in normal andtransformed mammary cells and in breast tissue derived from healthy women ascompared to breast cancer patients. Mammastatin has been previously described as three species ofprotein with apparent molecular weight between 40 and 65 kD . Since the original description, more has been learned aboutthe protein and separation of the protein on SDS-PAGE. Mammastatin is nowidentified as three protein species of 44, 49 and 53 kD in routine separations(Figures 2 in full article and 4). Mammastatin is identified as a 44 kD protein in some breastcancer cell lysates Mammastatin is not, however, identified as a 53 kD speciesin any breast cancer cell line or tissue lysates, which have been tested.Experimental evidence (in press), suggests that active Mammastatin is the 53 kDphosphorylated species. The 53 kD protein has been identified by immunoblot inall isolates of normal cells with one exception (Table 1). Normal tissue isolated from breast cancer patients has not yet been shown to express Mammastatin. As Table 1 indicates, approximately 70% ofavailable breast cancer cell lines contain 44 kD Mammastatin. The remaining 30%contain no protein measurable by anti-Mammastatin immunoblot. Sincedifferential expression in tissue culture could be an artifact caused byculture conditions or differential isolation of cell populations, expressionwas also measured in breast tissues by making direct tissue lysates. A similarexpression pattern was observed in vitro and in vivo (Figure4C). Surprisingly, normal tissue isolates from breastcancer patients showed no Mammastatin expression while normal tissue fromhealthy women demonstrated the same expression pattern observed from normalcells growing in culture (4C, lane 8 compared to 9). Lack of the 53 kD protein in normal cells from breast cancerpatients suggests that there is either systemic regulation of 53 kD Mammastatinexpression in breast cancer patients or a somatic mutation. To test thishypothesis, direct tissue lysates and lysates of tissue cells reduced toculture (after three days) were compared from healthy tissue and from tumortissue (Figure 4D). Normal breast epithelial cells andtissue lysates from a benign biopsy (BHMC) contain the 53 kD Mammastatinprotein (lanes 10 and 6 respectively). In contrast, lysates from tumor tissuesand cell lines contain either the 44 kD Mammastatin protein or no detectableprotein (4D; lanes 2,4 and 7-9). When benign tissue is grown in tissue culturethe 53 kD Mammastatin protein is induced (lane 5 compared to 6). When breasttumor tissue is grown in culture the 53 kD protein is also induced (lanes 2 and4 compared to 1 and 3). It was also observed that tumor cells stop growing inculture when 53 kD protein is expressed (data not shown). Induction of Mammastatin has been observed in all of thedifferent tumor tissue samples that have been reduced to tissue culture andcompared (7/7). These results suggest that either the tumor tissue has a veryhigh proportion of normal cells which are unable to produce 53 kD proteinin vivo, or that the tumor cells have not lost the ability to produce53 kD protein but do not do so in vivo. In either case, there appearsto be a systemic suppression of 53 kD Mammastatin expression in vivo,in breast cancer patients. The factor(s) regulating Mammastatin expression arecurrently being investigated. Differential expression of genes and proteins between normal andtransformed cells has become a paradigm of cancer causation. There isincreasing interest in the study of normal genes or proteins that might bemissing in cancer cells. We present here evidence to suggest that 53 kDMammastatin is not expressed in the majority of breast cancer cells but isexpressed in the majority of normal cells. Indeed, no immortalized cell lineand no primary tumor isolate has been identified that produces the 53 kD formof the protein. This differential expression is more consistent than most thathave been identified as important to the transformation process and maysuggests that loss of 53 kD Mammastatin is fundamental to the transformationprocess in breast cancer. Mammary cell growth rates can be influenced by a variety of factors, including steroid hormones, nutrients and peptide growth factors [1, 2, 3, 4]. Since control of cell growth determines whether a cell behaves normally in vivo, factors that influence mammary cell growth are of primary importance for understanding breast cancer. Many such factors have been implicated in the control of cellular growth. Steroid hormones have been shown to influence breast cell growth. These hormones are produced by reproductive and adipose tissue in the body and exert their influence on cells in distant organs. Steroid hormones interact with nuclear receptors that initiate transcription of specific genes, some of which may be involved in cell cycle control. Over-expression of estrogen receptor may lead to estrogen hypersensitivity, which could be a causative factor in many estrogen receptor positive breast cancer. Estrogen receptor positive breast cancers express more of this receptor than do normal mammary cells . Growth factor, signal transduction pathways may also be involved in expression of the malignant phenotype. Abnormal growth factor receptor expression [6, 7] and hypersensitivity to growth factors as well as constitutive activation of growth factor receptors may be a contributing factor for some malignancies [8, 9, 10, 11]. Other members of signal transduction pathways such as Ras, Raf, Shc and Src have been shown to be transforming if over-expressed or expressed in a mutated form [12, 13, 14,15,16]. Thus, abnormalities of stimulatory pathways can be responsible for the transformed phenotype. Certain anti-oncogenes are also involved in breast cancer. The p53 gene has been shown to be mutated in over 30% of breast cancers [17, 18, 19, 20]. Genes that may predispose patients to breast cancer, BRCA1 and 2 have also been described [21, 22, 23]. Loss of negative control due to mutation of tumor suppressors is another potential mechanism for uncontrolled cancer cell growth. Few factors have been identified, however, that will negatively regulate or suppress abnormal mammary cell growth. Mammastatin is one such factor . TGF-ß, and MDGI are also protein factors that have been shown to inhibit the growth of many mammary cell lines [25, 26]. If lack of TGF-ß were responsible for transformation it would be expected that TGF-ß expression would be lower in transformed cells than in normal cells. This has not been observed [27, 28]. Alternately, TGF-ß receptor could be inactive resulting in tumor cells that do not respond to TGF-ß. It has indeed been demonstrated that many tumors express active TGF-ß but do not respond well to this growth inhibitor . Although MDGI has not been reported to be altered in tumor cells compared to normal cells, there is evidence that MDGI can be a tumor suppressor [30, 31, 32]. Lack of response to negative regulators, due to decreased expression of inhibitors, lack of receptors, unresponsive receptors or defective signal transduction pathways may all contribute, along with growth promoting mutations, to the transformation process [33, 34, 35]. Mammastatin is a protein identified in normal human mammary cells . Mammastatin, identified in and isolated from normal human mammary cell (NHMC) conditioned media, inhibits the growth of transformed mammary cells in a tissue-specific manner . Since it is possible that lack of a growth inhibitor may be involved in loss of growth control, Mammastatin is being studied as a potential breast cancer therapy. Measurement of Mammastatin in serum also shows potential as a method to evaluate breast cancer risk. These studies describe the expression patterns of Mammastatin in normal and transformed cells and in healthy women as compared to breast cancer patients. Normal human mammary cells (NHMC) were derived from human tissueobtained from plastic surgery or from the Cooperative Human Tissue Network. Thesecells were reduced to culture by Type III collagenase (Life Technologies)digestion (overnight with 4 units/g @ 37°C) and differentialcentrifugations (3-4, 1000g, 5 min. centrifugations saving pellet, washing withfresh media, 2- 1g sedimentations saving pellet). Cells were maintained for oneweek in DMEM/F12 (Life Technologies) with 5% equine serum, 10 ng/ml EGF, 1μg/ml insulin, 100 ng/ml cholera toxin, 0.5 μg/ml hydrocortisone withgentamycin and were grown in low calcium (40 μM) [DMEM/F12 with 40 μMCaCl2 (Life technologies, custom services) supplemented with 5% chelex (Sigma)treated equine sera (Sigma), 0.1 μg/ml cholera toxin (Sigma), 0.5μg/ml hydrocortisone (Sigma), 10 ng/ml epidermal growth factor (EGF,Collaborative Research, Bedford, MA), 10 μg/ml insulin, 1 unit/mlpenicillin/streptomycin or gentamycin sulfate] media which was changedfrequently (3-4 day intervals) for long term growth [24,36]. Cells were considered to beorganoid cultures for the first week after reduction to tissue culture whenrecognizable organ structures such as ducts and alveoli were still evident.Cells in low calcium media were expanded by collecting floating cells fromconfluent cultures when feeding, and replating these 'floater'cells in fresh flasks. Cultures could be trypsinized several times during the first fewweeks of culture without damage but frequent trypsinization did not encouragerobust growth. Carcinoma cell lines were grown in the media suggested by theATCC for each carcinoma cell line with the exception of MCF-7 cells which weregrown in MEM (minimal essential media, Sigma) supplemented with 10% FBS(Hyclone) non-essential amino acids (Sigma) and insulin (10 mg/L). Carcinomacell line populations were expanded and cells densities were thinned bytrypsinization to remove adherrent cells and replating on fresh flasks at lowerdensity. Carcinoma cultures were kept in logarithmic growth by allowing cellsto become at most 75% confluent, feeding at three and four day intervals anddiluting cultures by a factor of ten when cells were replated on fresh flasks. Lysates of normal mammary cells and mammary carcinoma cells wereprepared by washing adherrent cells twice with 10 mls of isotonic PBS or TBSbuffer before lysing. Normal and transformed cells were then lysed by directaddition of SDS-PAGE sample loading buffer (0.05 M Tris, 10% glycerol, 2% SDS,0.005% Bromophenol Blue). Cells were collected into an isotonic buffer (usingsterile, teflon, cell scrapers), counted by Coulter Counter (CoulterElectronics, Miami, FL), measured for protein concentration by BioradTM (BioradCorp., Melville, NY) assay , and then lysed withSDS-PAGE sample loading buffer. Cells were lysed at protein concentrations of 1mg/ml. Lysates of fresh tumor were obtained by weighing an excised piece oftumor (obtained from surgery or from the Cooperative Human Tissue Network,CHTN) and resuspending the tissue, after mincing with sissors, at 1 mg/ml ofprotein in SDS-PAGE sample loading buffer. We assumed that the total weight ofthe tumor tissue was contributed by protein. Tumor lysates were homogenizedusing a polytron homogenizer. Homogenization was continued on ice until auniform suspension of tumor was obtained (1-2 minutes). Sections of normal mammary gland and breast tumor were obtained fromThe Pathology Department at the University of Michigan from both parafinembedded tissue and frozen tissue. These sections were cut on a microtome to10-40 micron thickness (normal tissue consistently required a thicker(40μ) section because of substantial adipose content). Sections wererolled onto poly-lysine coated slides and air dried. Sections were fixed with50% methanol, 15 % acetone in PBS buffer (4°C, 15 minutes, fixed tissueswere stained using DAB substrates). Immunoperoxidase staining was performed on tissue sections fixed onpoly-lysine coated slides. Fixed samples were incubated for 15 minutes with 5%non-fat dry milk (NFDM) in TBS to block non-specific binding. Primary antibody(7G6 anti-mammastatin or 38C13 anti-idiotypic control (Gift from Dr MarkKaminski, University of Michigan) was added at a concentration of 1:250,antibody in 5% NFDM in TBS (approximately 5 μg/ml), and incubated for 2hours at room temperature. Slides were then incubated in TBS with 0.1% TritonX-100 for five minutes, three times at room temperature. Care was taken not todisturb cells on slides when adding or removing solutions. Secondary antibody(peroxidase conjugated goat anti-mouse IgM) was incubated with the slides for1.5 hours at a concentration of 1:500 (2 μg/ml), antibody:buffer at roomtemperature in 5% NFDM/TBS. The slides were incubated in TBS with 0.1% TritonX-100 for five minutes, five times, before development with DAB substrate. Slides were preserved with a drop of aquamountbefore application of a glass coverslip. 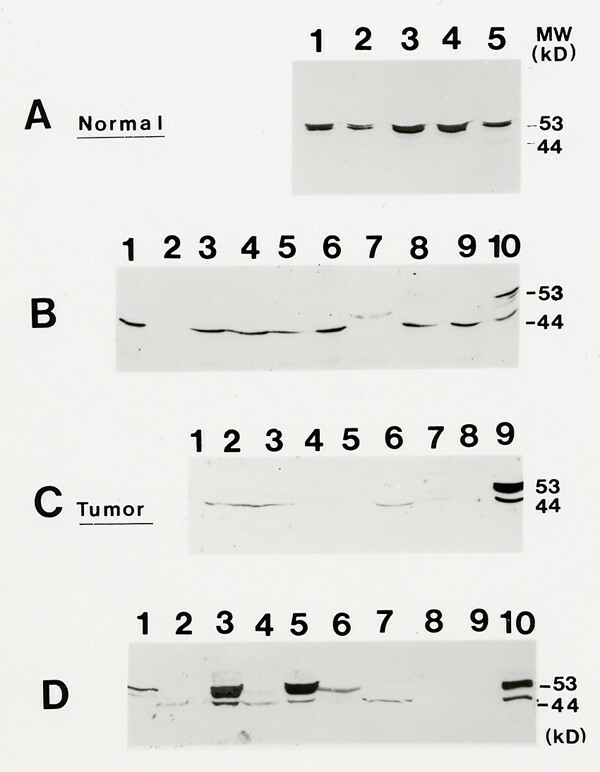 Western Blots were performed essentially as described . Proteins from ten percent SDS/PAGE gels were transferredelectrophoretically to nitrocellulose membranes (0.45 μm Schleicher andSchuell) in the presence of 10% methanol without SDS for 1.5 hours at 200 mAusing a Biorad mini-transfer apparatus. Filters were removed and sample laneswere incubated with 5% NFDM in TBS buffer to block non-specific binding ofproteins to the membrane. Membranes were incubated in blocking buffer for 30-60minutes and then incubated with the primary antibody. Filters were incubatedthree times with 0.1% Triton X-100tmin TBS for five minutes, toremove unbound primary antibody. Secondary antibody (Alkaline phosphataseconjugated goat anti-mouse IgM, (Southern Biotech Corp., Birmingham, Al.) wasincubated with the filters for 1 hour at a 1:1000 dilution in 5% NFDM/TBS atroom temperature. Filters were incubated, following second antibody, with 0.1%Triton X-100 in TBS for five minutes, five times at room temperature. Proteinswere visualized using the NBT/BCIP substrate system (Life Technology). Breast cancer research has depended greatly on the study of breastcancer cell lines. Cell lines such as MCF-7 and MDA-MD-231 are extensively usedto determine what factors might cause breast cancer and also how breast cancermight be treated. The use of cancer cells for study rather than normal breastcells has been influenced by two factors. Immortalized cancer cells can begrown long term in culture whereas normal cells will only grow for four to sixweeks. This makes reproducible studies using normal breast epithelial cellsvery difficult. In addition, investigators initially believed that cancer,similar to other diseases might be caused by a virus or other contaminatingfactor. A logical approach was to study the cells in which such a virus mightbe identified. Although some cancers have been shown to have viral causation,most cancer is now thought to be caused by mutations to genes that code forcellular factors influencing growth control. Viral integration into the genomeis but one method of interrupting genes that have important functions in growthcontrol pathways. The merit of comparing normal cell growth control mechanismsand growth control in immortalized cancer cells seems more important as ourunderstanding of cancer expands. Photograph of NHMC grown inlow and high calcium media. NHMC from reduction mammoplasty were cultured inDMEM/F12 media with equine serum, EGF, insulin, cholera toxin, hydrocortisoneand antibiotics. A) NHMC grown in DMEM/F12 with 40 μ M calcium chloride.B) NHMC culture from "A" switched to DMEM/F12 with 1.0 mM calciumchloride for 24 hours. Mammastatin Immunoblot:Normal Human Mammary Cell (NHMC) lysates were separated in two separateexperiments. Cells were solublized in SDS/PAGE sample loading buffer at 1 mg/mland 20 μg of cell lysates was separated on 10% PAGE. Protein wastransferred to nitrocellulose and probed with anti-Mammastatin antibodies. LaneA) NHMC-20 probed with 7G6.6 monoclonal antibody. B) NHMC-21 probed with 7G6.6monoclonal antibody in a separate experiment. C) NHMC-21 probed with 3C6 in thesame experiment as "B". Immunoperoxidase Staining of mammary tissues and cell lines: Tissuesections were made from normal human mammary tissue at the University ofMichigan Pathology department. Sections were stained with anti-Mammastatinantibody 7G6.6 or a control antibody 38C18. Sections were developed withperoxidase conjugated Goat-anti-mouse antibody and DAB before hematoxilyncounter-staining. A) Normal human mammary tissue with 7G6.6, B) Normal humanmammary tissue with 38C13, C) Mammary Carcinoma with 7G6.6, D) MammaryCarcinoma with 38C13. Immunoblot Analysis of Cell and Tissue Lysates: Lysates were made of normal human mammaryepithelia and tumor cell lines. Cell lysates were made, and soluble proteinswere loaded at a final concentration of 1 mg/ml. Samples were separated on 10%SDS-PAGE in a Mini-Protean II apparatus (25μg/sample), transferred tonitrocellulose, and probed with the anti-Mammastatin monoclonal antibody,7G6.6, or the IgM control Antibody 38C13 developed colorometricaly withNBT/BCIP. A. (Normal Mammary Cells) Lane 1) NHMC-17, 2) NHMC-16, 3) NHMC-15, 4)NHMC-14, 5) NHMC-6, Repeated many times with similar results. B. (CarcinomaCell Lines) Lane 1) SK BR-3, 2) Du 4475, 3) MDA MB-361, 4) ZR-75-30, 5) BT-549,6) MCF-7, 7) Sum 102, 8) Sum 52, 9) Sum 44, 10) NHMC-21, C. (Breast TumorTissue) 1) DW tumor lysate, 2) IR tumor lysate, 3) EW tumor lysate, 4) PH tumorlysate, 5) SE tumor lysate, 6) AW tumor lysate, 7) EJ tumor lysate; 8) SPnormal tissue (from cancer patient), 9) NHMC-12 organoid. Repeated three timeswith similar results, D. (Primary Culture of Breast Tumor Tissue) Lane 1)CHMC-42, 3 days, 2) CHMC-42 tissue, 3) CHMC-39, two days, 4) CHMC-39 tissue, 5)BHMC-40, three days, 6) BHMC-40 tissue, 7) ZR-75-1 carcinoma, 8) MDA 435carcinoma, 9) MDA 231 carcinoma, 10) NHMC-20 primary culture. Analysis of Mammastatin expression by immunoblot: Lysatesof fresh tissue, primary cultures and cell lines were analyzed by 7G6.6,anti-mammastatin, immunoblot. N = number of individual samples repeated at least3 times. (++++) intense expression, (-) no expression, NT = not treated. Inhibition Assays: Cells were plated in growth media at 104cells/ml and treated with 10 ng/ml purified Mammastatin or control. Culturescounted by Coulter Counter after six days culture. Carcinoma cells in which mammastatin was detected: MCF-7,ZR-75-1, T47D, Sk Br 3, ZR-75-30, BT 475, UACC 893, MDA-MB-361, Sum 44, Sum 52,Sum 102 (Sum lines from S. Either, Uof Mich), Hep G2, OvCar, BxPC3, andA253. Carcinoma cells in which mammastatin was not detected:MDA-MB-231, BT-20, MDA-MB-435, HBL-100, Du 4475, UM 17B (squamous line from T.Corbett Uof Mich), SK Mel 31, 293T, HT 1080. * Two additional normaltissue lysates from breast cancer patients showed no Mammastatin expression. ** Similar size proteins (between 40 and 55 kD) were identified inBxPc3, HepG2 and OvCar, A253 cells but these cell lines did not producedinhibitory activity. Historically, normal breast cells have not been cultured long-termwith significant success. This has been a recurring roadblock to studiescomparing normal and cancerous breast cell regulation in vitro. Inorder to develop a system that would allow for such a comparison, it has beennecessary to establish a method for long-term growth of normal human breastcells. The method currently used in our laboratories to culture NHMC waspioneered by the investigator that produced the MCF-7 cell line, Herb Soule. Dr. Soule, who was at the Michigan CancerFoundation until his death, discovered that NHMC could be cultured fromreduction mammoplasties and grown long-term in laboratory tissue culture if thecells were maintained in a DMEM/F12 media with 40-60 μM calcium. The useof calcium depleted equine serum, cholera toxin, hydrocortisone, insulin andepidermal growth factor stimulates cell growth. The lack of calcium seems tointerrupt the normal senescence pathways in these cells and allows the cells toexpand in tissue culture for more than twelve months. Cells are confluent lawnsof cuboidal cells (Figure 1A) which are expanded bycollecting budding cells, or "floaters", that will reattach tofresh tissue culture plastic. If cells are returned to physiologic levels ofcalcium (1-2 mM) the cells will flatten out and senesce (figure 1B). This phenomenon is consistent in all normal cell cultures that havebeen in culture for longer than one month. Cultures that are maintained formore than two weeks at physiologic calcium concentrations, after they have beenin long-term culture, cannot be induced to grow again. Cultures that areexposed to calcium for a shorter period of time can often be induced tocontinue growth if calcium levels in culture media are brought back down to 40μM. Mammastatin was discovered in 1986 utilizing the ability to comparecancer cell growth to normal cell growth in high and low calcium. Normal cellsgrowing in low calcium conditions behave more like transformed cells. Whencultured under low calcium conditions cells do not appear to be densityinhibited and will proliferate in an exponential manner for long periods oftime. The cells are not tumorigenic however since they will not grow in nudemice or on soft agar. This growth pattern suggested that there was a factorproduced in "high" calcium conditions, affecting growth, that wasnot produced in "low" calcium conditions. Surprisingly, when mediaconditioned by normal cells from the two conditions were compared, the lowcalcium media contained significant growth inhibitory activity for MCF-7carcinoma cells while the high calcium media had less inhibitory effect.Subsequent studies demonstrated that Mammastatin was a calcium dependent growthinhibitor (data not shown). It is expressed at much higher levels in lowcalcium media than in physiologic calcium perhaps because of an interrupted"feed-back" mechanism. Mammastatin has been previously described as a tissue specificgrowth inhibitory protein . The protein was describedas three species of protein with apparent molecular weight between 40 and 65kD. Since the original description, more has been learned about the protein andseparation of the protein on SDS-PAGE has become routine. Mammastatin istypically identified as three protein species of 44, 49 and 53 kD apparentmolecular weight in routine separations. When the protein is highly purified,it is difficult to separate consistently on polyacrylamide gels. The originalpublication on Mammastatin described protein that was purified from monocloncalantibody affinity chromatography. We now describe active, growth inhibitoryMammastatin as a 53 kD protein as identified by monoclonal antibody in WesternBlotting experiments (Figure 2 and 4). Monoclonal antibodies against Mammastatin were prepared byimmunization of Balb C mice with protein purified by ion-exchange andhydrophobic interaction chromatography. The first anti-Mammastatin monoclonalantibody 3C6, was identified by its ability to block Mammastatin activity. Subsequent monocloncal antibodies were made byimmunization of animals with protein purified by 3C6, antibody-affinitychromatography. Identity of subsequent monoclonal antibodies was determined bythe ability of these antibodies to recognize the same proteins as 3C6 inWestern Blot (Figure 2), and their ability to removegrowth inhibitory activity from NHMC conditioned media (data not shown). The7G6 monoclonal antibody was identified by screening with purified Mammastatinin ELISA assays, by comparing recognition patterns, and by immunoprecipitatinggrowth inhibitory activity. The antibody is a high affinity, specific binder ofMammastatin protein. Using anti-Mammastatin monocloncal antibody 7G6, it has beenpossible to identify Mammastatin in vitro and in vivo.Immunohistochemistry of breast tissues suggests that Mammastatin is producedby the epithelial cells that line the lumen of the mammary gland (DAB (brown)staining, figure 3A). Mammastatin expression isidentified in the epithelial bilayer of cells lining the lumen and seems to beexpressed consistently in all normal cells. Some Mammastatin expression is alsoidentified in breast tumors (Figure 3C) but staining isless intense and not organized. Identification of Mammastatin by immunohistochemistry in breasttumors is not unexpected. Mammastatin is identified as a 44 kD protein in somebreast cancer cell lysates (Figure 4B 4C 4D). Mammastatin is not, however,identified as a 53 kD species in any breast cancer cell line or direct tissuelysate, which has been tested. Experimental evidence (in press), suggests thatactive Mammastatin is the 53 kD phosphorylated species. The 53 kD protein hasbeen identified by immunoblot in all isolates of normal cells with oneexception (Table 1). Normal tissue from breast cancerpatients has not been shown to express Mammastatin. Approximately 70% of available breast cancer cell lines (figure4B) and tissue lysates contain 44 kD Mammastatin. Theremaining 30% contain no protein measurable by anti-Mammastatin immunoblot. Although Mammastatin is present as a 53 kD protein in normal celland tissue lysates, and present as only a 44 kD protein in 70% of breast cancercells and tissue lysates, it is surprising that neither the tumor cells or thenormal cells from breast cancer patients seem to contain the 53 kD Mammastatinprotein (Figure 4C, lane 8). Lack of the 53 kD protein innormal cells from breast cancer patients suggests that there is either systemicregulation of 53 kD Mammastatin expression in breast cancer patients or asomatic mutation. To test this hypothesis, direct tissue lysates and lysates oftissue cells reduced to culture were compared from healthy tissue and fromtumor tissue (Figure 4D). Normal breast epithelial cellsand tissue lysates from a benign biopsy contain the 53 kD Mammastatin protein(lanes 10 and 6 respectively). In contrast, tissue lysates from tumor tissuescontain either the 44 kD Mammastatin protein or no detectable protein (4D;lanes 2 and 4 and 4C). When benign tissue is grown in tissue culture the 53 kDMammastatin protein is induced. When breast tumor tissue is grown in culturethe 53 kD protein is also induced. The tumor cells also stop growing in culturewhen 53 kD protein is expressed (data not shown). The induction of Mammastatinin primary tumor isolates has been observed in seven different tumor tissuesamples that have been reduced to tissue culture and compared to directlysates. These results suggest that either the tumor tissue has a very highproportion of normal cells which are unable to produce 53 kD protein invivo, or that the tumor cells have not lost the ability to produce 53 kDprotein but do not do so in vivo. In either case, there appears to bea systemic suppression of 53 kD Mammastatin expression in vivo, inbreast cancer patients. The factor(s) regulating Mammastatin expression arecurrently being investigated. Investigators working with keratinocyte culture systems pioneered the process of growing normal human mammary cells in reduced calcium media. It is not surprising that this system prolongs the growth of other cell types in laboratory tissue culture. Indeed, we have been able to culture breast, prostate and colon tissues under similar conditions for extended periods of time as compared to "normal culture conditions" (cholera toxin must be removed from the media for culture of colon epithelia). The population of cells cultured under these conditions gives every indication of being "normal" in phenotype. It is not obvious that long term growth induces any change in populations of normal cells other than allowing more cell division than would occur otherwise. The cultures stop growing if calcium conditions are raised, and cultured cells cannot be grown in soft agar . Extending the life of normal cells in tissue culture offers the ability to expand the populations of cells so that they are available for extended and reproducible investigation. Cultures of NHMC grown under these conditions have been routinely expanded in our laboratories from 1 kg of tissue to epithelial populations of more than 109cells. The reduction to primary culture is consistently successful if the initial surgery is clean and the breast tissue sample is supplied devoid of skin in saline. Tissue samples can be held in ice for up to 24 hours before processing which allows overnight shipping. The populations of breast cells obtained in primary culture are initially mixed with some fibroblasts, myoepthelial cells and basal clear cells. Eventually, since only the squamous epithelial cells seem to "bud" into the media, the secondary cultures become predominately squamous. A primary use for large-scale culture of NHMC in our hands has been the production of native Mammastatin as a drug product. Serum free conditions have been devised for short-term cultures that allow Mammastatin to be produced and isolated for use as an injectable drug. What is most interesting about this culture condition is that it seems to circumvent the normal senescence pathways. Normal human mammary cells can only be maintained for short periods in laboratory tissue culture using techniques that have been widely adopted. If comparison to the transformed phenotype is to be meaningful and widely implemented it seems that routine culture conditions for NHMC, that allow long term culture, should be adopted. Use of low calcium conditions has several advantages. The technique can be used to extend the viability of NHMC in culture to facilitate study. The technique can also be used as a model for calcium induced senescence, as a method to generate specific subpopulations of mammary cell types and as a way to produce Mammastatin and possibly other proteins. The ability to compare normal human mammary cells and breast cancer cells growing in laboratory culture has allowed the observation that there is a consistent difference in Mammastatin expression in normal breast epithelial cells as compared to breast cancer cell lines and tumors. We have not yet identified a breast cancer cell line that makes the 53 kD form of Mammastatin (sixteen tested). Breast tissue lysates have also produced either no Mammastatin or only 44 kD Mammastatin. The observation that 70% of breast cancer cells express 44 kD Mammastatin in vivo and in vitro suggests that whatever change causes this differential expression is similar both in vitro and in vivo. It is interesting to note that although active Mammastatin is differentially expressed in normal vs. mammary tumor cells, this differential expression would not have been identified by differential display as being particularly informative. Only a protein-based study of Mammastatin, such as we have pursued, identifies the protein as important. This is a case where post-translational modification of the protein may be more important for regulation than expression at the message level. Differential expression of genes and proteins between normal and transformed cells has become a paradigm of cancer causation. While it is true that the majority of cancer research has focused on genes or proteins that are expressed in cancer cells but not in normal cells, there is increasing interest in the study of normal genes or proteins that might be missing in cancer cells. We present here evidence to suggest that 53 kD Mammastatin is not expressed in the majority of breast cancer cells but is expressed in the majority of normal cells. Indeed, no immortalized cell line and no primary tumor isolate has been identified that produces the 53 kD form of the protein. This differential expression is more consistent than most that have been identified as important to the transformation process. This observation suggests that loss of 53 kD Mammastatin expression may be fundamental to the transformation process in the breast. Several special cases of differential Mammastatin are of particular interest. Immortalized "Normal" cell lines such as MCF-10 fail to express 53 kD Mammastatin (data not shown). This suggests that cells cannot be grown long term with physiologic calcium levels in the presence of 53 kD Mammastatin. The observation that primary tumor tissue, which begins to express 53 kD Mammastatin, stops growing, would support this hypothesis (figure 4). It is also interesting to note that normal cells from breast cancer patients may lack Mammastatin. A definitive conclusion on this question is not possible because of the small sample size (2 samples tested) but this observation may explain why transformed cells are able to grow in vivo. We would not expect cancer to develop if Mammastatin is secreted from normal cells in vivoand tumor cells are consistently responsive to Mammastatin as has been observed. If Mammastatin is not expressed by normal cells in breast cancer patients it is possible that this is due to a systemic regulation of Mammastatin expression. The observation that Mammastatin expression increases in vitro, even in primary cultures of tumor cells (figure 4D) supports the conclusion that there is a systemic or structural regulator of Mammastatin that is no longer present when breast cancer cells and/or normal cells from breast cancer tissue are removed from the body of a breast cancer patient. If Mammastatin is a normal growth regulator it is not surprising that it is not expressed in its active form in breast cancers. What is somewhat surprising is the frequency at which it is not expressed. In 25 breast cancer tissue samples we have never identified 53 kD Mammastatin when tissue is analyzed directly from a patient. In contrast, Mammastatin is always expressed in mammary epithelial cells identified from healthy females. The consistent differential expression of Mammastatin suggests that the protein is important in cancer of the breast. Of particular interest are the questions of whether Mammastatin inactivation is required for breast cancer progression and the affect of Mammastatin replacement therapy on progression in patients with the breast cancer. These questions are the subject of current clinical trials.